Occasionally runs to a nearby corpse and fetches a bone. 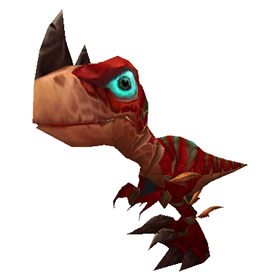 This raptor companion is available upon defeating Bloodlord Mandokir in the new five-man heroic Zul'gurub dungeon. Players who have completed the level 20+ Lashtail Hatchling quest chain will find a captured Lashtail Hatchling in the instance, which they can save, and conclude this raptor's storyline. To begin the lower level quest chain, horde players will need to pick up the quest The Defense of Grom'gol: Raptor Risk and alliance players will need to pick up the quest Bad Medicine. Unlike other pets, the Lashtail Hatchling will proudly sport the title of 'aka instead of 's Companion. Flanks the enemy 1-2 times, dealing 197 Critter damage per hit. If you pretty much play solo as I do, and couldn't get to her as a 90 (Heroic ZG is pretty tough as a 90 solo). Head on back in at 100. The changes in the combat system actually make it an easy clear, it's just annoying having to get past the boulders. After you get her back, she can watch you kill everything in there as payback for taking her from you. Finally got one! I had some guild buddies help with the dungeon bc my lvl90 hunter is a a pet hunter not a fighter, lol. Love this pet! My hardest part was being the lashtail quest. What a great way to obtain a pet. I Really enjoyed the questline and she (regardless of breed) will always be a favorite. You have to be lvl85+ to save her. Once you've completed the lvl24ish quest line in Northern Stranglethorn, do lvl85 heroic ZG, you'll find the lashtail hatchling by Bloodlord Mandokir, all chained up and enslaved. She will have the quest "An Old Friend" for you after you defeat Mandokir. Accept it, talk to her again to complete it, and she comes as the reward. I actually submitted a ticket asking Blizz to categorize her as the girl she's supposed to be and to give us our 'aka after our names back. Yes, I was that irritated :P We did all that work for her and now our bonded names are gone! So its a "she" in all the quests, but the breed is male? Please change that Blizz. Start the quest chain with an alt and once you get the egg you can have both the pre-ZG and post-ZG versions of her out at the same time. In ST that is ofc. Not 100% sure, but I'm thinking that you may be able to rename her back to the way it was (did not try renaming any yet, so not sure if available). This is my favorite pet of all time! The quest line is adorable and her scars make her unique among the baby raptors. The emote is super cute too & a nice match when you're working on archaeology-- you dig up artifacts, she's gnawing on a corpse & digs up a bone. For me, obtaining this pet was far more frustrating than any grinding job. I went through hours and many groups queuing for the dungeon, even trying to create my own with guild members. After the last boss is killed, DO NOT leave the dungeon like I did (twice, really? Yeah really). I never caught the drift when I was given the info at first, but the quest to obtain this raptor is inside the instance. Mount up and run to the quest point in the lower right corner before you leave. For those of you who don't wish to engage in PvE, you do not need to be present for the Bloodlord kill to be offered the quest. A friend of mine just finished ZG, summoned me in and I finally got this little bugger. Having a pet with a back story is a brilliant idea, Blizzard should do more like this. I currently can't complete the quest chain to be able to get this little girl. Be Raptor, is completely broken for me and I phase into ZG without the ability to interact with anything. Blizzard said that many vehicle quests are broken at the moment and they hope to fix it when they can. I hope this helps anyone else that is having problems! the part of the quest chain,be raptor, is currently bugged for many , or all probably, since it seams to be server side. then dont delete your hole system, clear wtf etc... , just sit back an wait for blizz to fix it. Be a Raptor is bugged for me =( When I get ported into ZG as the lil raptor the first one i need to talk to, to start the event isn't there... Ticket is in to a GM. I dropped and restarted the quest multiple times. Something interesting I've found about the pet that makes my heart break just a little more. The quest "an old friend" saying "shes earned a few scares" isn't just flavor text. Compare the companion with the NPC (Ohgan'Aka) and you'll notice that she dose have small scars around her mouth and large ones along the back of her neck that she didn't have before. This post helped me get my raptor. It's a pretty detailed walk-through, since I got stuck about one quest in. As mentioned, the level 85 troll quest line in STV phases you, and you will not be able to see/complete any quests towards your hatchling if you're in the midst of the troll quests. You'll have to either complete those first, or not start them at all until you're done. This is officially my favorite pet, ever. I've noticed two interesting things about her, though. 1) The part about her being slightly larger isn't just filler text - she IS a little bigger than the other raptor hatchlings, from what I've seen. 2) She doesn't just pull bones off enemy mobs. When I was standing next to a party member's corpse, little Petshop'aka ran over, and brought me a bone from him. I guess she thought I needed something to remember him by. Born in the jungles of Stranglethorn, unlucky raptor hatchlings are often captured by the Gurubashi and taken to the troll city of Zul'Gurub.